People love games! Why do you think that regularly scheduled events like “Family Game Night” and tournaments centered around outdoor games (Check out Jam Kancer in the Kan!) have become so popular? Because they’re fun. They’re engaging. And… they’re easy enough for anyone to play. You don’t have to be the most talented athlete or the smartest kid in the room to be successful at a typical board game. Jenga? You only need a steady hand. Twister? A little flexibility goes a long way! Operation? Well... you get the idea. Scattergories. Create a game card with a number of different categories related to the unit you are studying. For example, in science class, a card might feature the following list: Elements, Physical Changes, Chemical Changes, Molecules, Liquid, Gas, and Solid. Now, roll the letter die that comes with the game or simply choose a random letter of the alphabet. The twist is that students must complete their lists using only answers that begin with the selected letter. Use this simple Scattergories template to create your own game cards using Google Docs! Jenga. Number all of the blocks in your Jenga stack. As students select a block, they must ask answer a question from a list that corresponds with the number on the block they removed. Answer the question right, and and the block goes back on the top of the stack. Answer the question wrong, and the block is removed from play. The winning group is the team who creates the highest Jenga tower with the least number of blocks removed from the stack. CandyLand. Think about a current classroom concept and come up with FIVE basic categories. (Are you reading a class novel? Categories like Characters, Plot, Conflicts, Setting, and Random work perfectly!) Assign each of your five categories a different color from the Candy Land game board. Then, create 5-10 questions per category. Students will spin the provided spinner and advance their token to the color indicated. The student is then asked a question from the corresponding color. If the student answers the question correctly, she stays on that space. Incorrectly? She move back to their previous spot on the board. For added fun, keep the other rules form the original game in tact. Come on...who wouldn’t want to cross a rainbow bridge to sneak to a further level in the game? Memory. Use index cards to recreate this old time favorite. Select 8-10 vocabulary terms. On one card, list a vocabulary term. On the other, print the term’s definition. Place the cards face down and have students try to find the matches. If a student finds a matching pair, they keep the cards. If their selections do not match, the cards are placed back into play in the same location on the “board.” Short on time? Check out Filppity’s newest feature for creating a digital version of this childhood favorite. Cup Stacking. (Yes, this is a thing!) Grab a sleeve of solo cups and label them with a number of terms that need to be placed in order. In English class, you could try the elements of plot: Exposition, Inciting Incident, Rising Action, Climax, Falling Action, and Resolution. Students must work together to stack the cups in the correct order with only a half sheet of paper between each one. As a bonus, have them remove the sheets of paper in order to get the cups to fall into a neat stack. Confused? Maybe this image will help. Need even more ideas to gamify your classroom and recycle long-forgotten board games? Just ask your students! Give them a voice and have them gamify a classroom concept using a game from their own childhood. You might be amazed at their “outside the (game) box” thinking when it comes to bringing the fun to their own learning. September. For many, this month marks a number of firsts. But to teachers, the firsts don't end there. Every September is an opportunity for countless new beginnings. This means that we have the opportunity to write our own firsts each and every school year. It's like having a blank playbook where we get to write the winning game plan. So whether it's trying out a new instructional strategy for the first time or taking a risk with a new edtech platform, September is the perfect time to step out of our comfort zones and try something new. And, if you've been thinking about getting started with Google Classroom, September is the perfect time. With brand new classes, new rosters, and a clean playbook, the possibilities are endless! Not convinced? 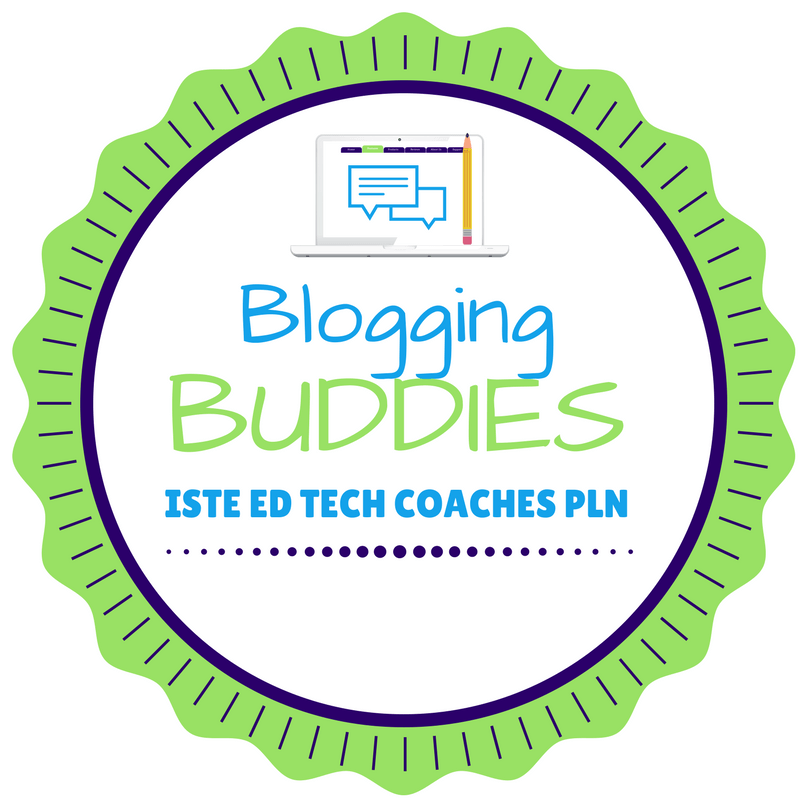 Check out these five strategies to get you off the sidelines and into the Google Classroom game this September. The end of the school year comes with a lot of excitement… and a lot of questions. This year, the most popular one being, “What happens to my Google Classrooms when this year is over?” Contrary to popular belief, teachers’ Google Classrooms will not magically disappear or be deleted over the summer. (Do we hear an audible sigh of relief?) In fact, many teachers are relieved to learn that it is actually the teacher who controls what happens to the Classrooms. With this in mind, Kristen Tsaoys and I have a few suggestions for simplifying your end-of-the-year Classroom cleanup to help ease the transition to next school year. Click the following link to access our revised Classroom Closeout eBook, or simply check out the PDF below. Please feel free to share! I think we can all agree that emojis are the modern day hieroglyphics. In fact, our students are sharing complete thoughts--and complete stories-- in get this, PICTURES. It’s true! Take a peek at the phone of any tween or teenager. Most of their ideas and emotions are summed up in one little icon. Something’s drop-to-the-floor funny?  will do. Do they have parents looking over their shoulders? Insert  . ​Visual summaries. Challenge your students to use emojis to summarize pieces of text. Take a look at this example from the prologue of Romeo and Juliet. Are you a science or social studies teacher? Why not call for students to summarize important historical events or moments of discovery using emojis? Feedback Fun. The comment feature of Google Docs is a great way to provide meaningful feedback to students in real time. Why not up your feedback game with emojis to share your thoughts and reflections on students’ writing? Google Classroom Questions. Post an open-ended question in Google Classroom and have students respond using emojis. Whether you are asking them to reflect on their learning or to use the icons to show agreement or disagreement as part of a class poll, emojis are a great way to get students to process their thinking and share in a new and innovative way. Math Challenges. During a recent coaching visit, a math teacher (Thanks, Melanie!) introduced me to the idea of emoji algebra. Basically, the teacher shares a math problem that incorporates emojis to symbolize numbers and variables, and students have to use inductive reasoning and creative problem-solving skills to arrive at a solution. Just Google “emoji math”, and you will be shocked by the amount of emoji-based math problems that have been posted to sites like Pinterest and Teachers Pay Teachers. Why not create your own math puzzles and problems using emojis? Or, better yet, have students create their own problems to share with their peers. Digital Exit Tickets. Have students use the emojis to gauge their understanding of a new topic. They can add the emoji as a comment to a shared Doc, on a note in Google Keep, or even as a comment of a post in the Google Classroom Stream. We knew it was bound to happen. According to a recent study, more teens than ever are spending hour upon hour each day watching YouTube. In fact, for the first time ever, YouTube has edged out cable TV as one of their most watched platforms. TubeChop Have you ever showed a video to your class, but realized later that the whole video wasn't really necessary? That you only needed to share a short clip? With TubeChop, there's no more sitting through irrelevant content and no more having to spend valuable class time fast forwarding or rewinding in order to find the perfect part. TubeChop brings you the exact content you want on your terms by allowing you to pull a clip from an existing YouTube video and creating its own link to share with your class. AdBlock Plus Do you know those annoying commercials that start off popular YouTube videos? The ones that last for what seems like 30 minutes completely stalling your momentum and letting the air out of your lesson? Adblock plus gets rid of those annoying commercials once and for all. No more sitting and waiting for the commercial to end or listening to student giggles as a semi-inappropriate commercials starts off your educationally sound YouTube content. (Although, maybe there is something to be said for commercials and engagement. I once had a group of eighth grade boys completely mesmerized by what I was showing after a lead-in by a Victoria's Secret Runway show ad!) 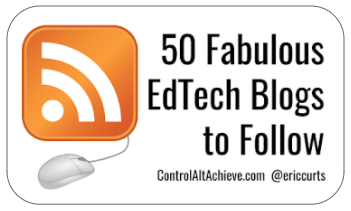 Adblock plus gets rid of those ads and gets your students watching the content you want right away. GIFit! Perhaps you wanted to add a looping set of directions to show students how to do something new. Or maybe you just wanted to create a looping reminder of an important concept. GIFit! allows you to pull out a few seconds of any YouTube video and create a never-ending loop of content. You can then insert this GIF into a doc, slide or anywhere else where you want put digital content in order to give your students a visual and extra reinforcement. Video Grabby Have you ever had those moments in class where you plan to show a YouTube video only to find that the Internet is down? You know those moments where you've had an amazing lesson plan, but because of a silly tech issue, you were forced to move onto Plan B. With video grabby, no more having to resort to that alternate plan. Video grabby allows you to download YouTube videos so that you do not need an Internet connection to access them. For many kids and teachers around the world, this week marks the return from spring break. Whether it meant relaxing in a hammock on a tropical island or enjoying the comfort of a family staycation, spring break brings a certain feeling of magic. The warmer weather. The lack of homework. The lack of essays screaming to be graded. Perhaps that's what makes the end of spring break especially difficult. Backpacks are packed, lunches are made, and a sense of sadness seems to hang in the air as the carefree days of spring break become a fading memory. But...does it have to be that way? Why should the first day back after a long vacation be any different than the vacation itself? In other words, what if we were able to hold onto that spring break magic for a little bit longer? Wear your sunglasses. That's right. Sunglasses. Start off a lesson wearing shades and don't say a word. Then jump into how you have a bright idea. It doesn't matter what the idea is, but the fact that you were wearing sunglasses will hook the kids and get them excited for whatever you have to say. Visit somewhere new. Whether it is an impromptu journey to read outside under a tree or a virtual field trip to transport the kids to somewhere they haven't been before, it doesn't matter. New experiences equal new memories. Let's make them in our classrooms. Go all inclusive. Give your students problems and challenges that require them to tap into everything they have learned this year. You'll be surprised by what they can remember and even more surprised that they actually like showing what they know. Crank some tunes. A little island music can help make anything seem a bit more fun. Fractions? No thank you. Island fractions? Why, yes please! Forget about homework. Yeah, that's right. I said it. One of the best things about spring break is the fact the families don't have to worry about spending countless hours on homework; they just get to spend time together. There's only a few more months of school and testing is almost over. Take a homework hiatus and watch your students' attitudes about school change for the better. Do something active. Whether it's getting up and going on a nature walk as part of a science lesson or simply employing GoNoodle to get kids out of their seat, make an effort to get them up and moving. No one sits around on spring break simply watching the minutes tick by. Part of the magic of spring break is the fact that we are always on the go. Open the windows. Let the sun shine in. Let the warm breezes and spring smells fill the classroom. Winter was long enough. Read a book. Put time aside to just read. And, an even crazier idea, let your students read what they want. Even in core subject classes, you can build in opportunities for student choice regarding reading. Historical fiction and nonfiction can help give students a better understanding of what they are learning in class. Plus, when students can empathize with a character and her situation, you have a better chance of making a topic more meaningful and relevant. Make time to share. All break long, my social media feeds were filled with pics of my friends' spring break adventures. What does that tell me? People like to share! It makes them feel good. It makes them feel empowered. Allow time for your students to share what makes them happy. You'll be surprised at what you learn. Visit the bathroom freely. Oh, wait. You're a teacher. Never mind. I cannot begin to tell you just how excited I was that my son was going to be using Google Google Classroom this year. Google Classroom is my jam. It’s my thing. 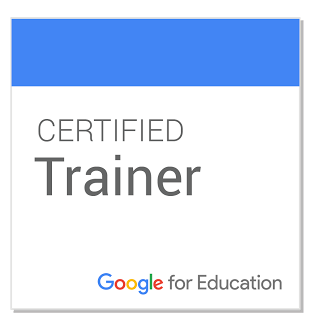 As an ed tech coach and professional development trainer, I spend half of my day training teachers on how to use Google Classroom to better engage their students and simplify the way we do things in the classroom. With that said, I promise that this is not another “How to Use Google Classroom" post or a Google Classroom 101 lesson. In fact, this post isn’t coming from a training perspective. It’s not even coming from an ed tech coach. This post is coming from a mom. I see the frustration almost daily: My son sifting through the Stream searching for things. My son looking for a file he started in his Drive that he forgot to name. (As of the most recent count, there were 27 files named “Untitled document” in his Google Drive. Twenty. Seven.) My son searching through his Stream for a study guide only to remember that the study guide was actually a paper copy. Oh, and that paper copy is at the bottom of his locker. I am not making excuses for my kid--I know he needs to get organized and be responsible. I’m working on that. (Really, I am.) But, I also know that there are a few Google Classroom “best practices” that could help him along the way. And if they could help my son, I’m sure that they could help the other sons and daughters who sit in your classroom every day. Mom Tip 1: Use the Topics Feature: The topics features will allow you to group all of your posts by a common topic. Are you posting an assignment related to astronomy? Assign the “astronomy” topic label to bundle it with all of the other posts on astronomy. This way, when your students have to review all of the materials on astronomy for an upcoming test, they need only click the topic label on the left hand side to access ALL of the materials they will need to help them prepare. Sifting through the stream and trying to guess which assignments are relevant not only wastes time, but can leave your students feeling overwhelmed and frustrated. Trust me. I know. Mom Tip 2: Even if You Give Hard Copies, Add Digital Ones to the Stream. My son is a disorganized kid. Sometimes he misplaces things. And I am sure he is not the only one. Mom Tip 3: Don’t Be Afraid of Guardian Summaries: Guardian summaries will not give parents full access to your Google Classroom. Nor will it give them access to your actual Stream. Instead, the summaries just provide a quick overview of recent posts and upcoming work. It can be a really great way to keep parents in the loop without oversharing. Still not convinced? Check out my quick infographic HERE. Mom Tip 4: Add Due Dates to Your Assignments: As adults, we live and die by our calendars. Heck, if it’s not on my calendar, it’s just not happening. Why not get our kids into the habit of using a calendar to keep organized and remember important due dates? By adding due dates to assignments, you will automatically create a post on your student’s Google Calendar. It’s kind of like having a personalized agenda with all of the due dates and deadlines for school all in one place. Mom Tip 5: Number the Assignments: Numbering assignments will not only impact the Stream, but will make such a difference in the students’ Drives. Right now, when I open any of my son’s Classroom folders, they are a hot mess. (Did I mention that my son is disorganized on his own?) Numbering assignments would put all of the work teachers distribute in numerical order right in the Classroom folder. (Check out @alicekeeler's post for the BEST information on numbering.) As teachers, we encourage the use of tables of contents in students’ physical notebooks. I’ve seen my own son number the pages of his paper worksheets and handouts. Think about the difference it would make if the digital handouts were numbered as well. Music teachers make it look easy. A few weeks back, I conducted a coaching visit in an eighth grade orchestra classroom. The class was made up of students of different ability levels, different musical backgrounds, and get this...completely different instruments. But yet, at the end of the lesson, they all played together to perform the same piece of music. ​Before starting my journey as a staff development coach, I taught middle school language arts for sixteen years. During this time, I encountered students from all walks of life and all walks of reading readiness. But, yet, they were all required to master the same skills and the same standards by year’s end. I can remember many a day where all of my efforts seemed fruitless. It was getting easier to place blame and harder to find the right balance between rigor and instruction that met the individual needs of my wide range of students. Visiting this music classroom really made me think. How can an orchestra teacher ensure that all students, with such a broad range of abilities and needs, are ready for the same concert? How can she be confident that her miniature musicians are ready to play the same piece, at the same time, in front of the same audience? This is where the definition of differentiation truly comes alive. By considering the students’ ability levels and adjusting instruction to fit the needs of the different instruments, a middle school concert shines as a symphony of differentiated instruction. And get this: in the music classroom, there is no period-long lecture. There is no “sage on the stage” playing for a passive audience. I watched as the music teacher literally took a step back and just let her students play. Of course, there were moments where she jumped in to give them corrective feedback and helped individual musicians refine their style, but that’s just it. The feedback was individualized. And relevant. And meaningful to each and every student. And yet, when class was over, all of the students were able to play the same piece. Yes, there were modifications. Yes, there were a few sour notes. Some students sparkled as soloists while others contributed to the overall rhythm of the piece. But they were all playing. Together. And they were successful. All of our students come to our classrooms with different needs and different abilities. Maybe it is time that we embrace the music classroom metaphor and think about our students as individual musicians who all need to come together to contribute to the same piece of music. How can we adjust our instruction to help them showcase their true abilities? How can we be sure that our lessons meet the needs of the different instruments that our students bring to the table? ​Just ask a music teacher. They make it look easy. The variety pack of cereal. As a kid, there wasn’t a more exciting way to start my mornings. You see, on most days, my mom set out breakfast for my sister, brother, and me in the rushed minutes before the bus came, and I was forced to gulp down whatever was put in front of me. But...on variety pack mornings, I was the master of my own breakfast destiny. I could choose what I wanted and wasn't forced to eat the bowlful of bran flakes that sat--soggy and listless--after being hastily poured from the family-sized box in the cabinet. The variety pack had a little bit of everything for everybody. In need of a morning pep talk? Rice Krispies answered back with the snap, crackle and pop that you craved. Looking for a sugar boost? Frosted Flakes were g-r-r-reat. Feeling a bit wacky? Nothing said kooky like a colorful bowl of Froot Loops. But...was the variety pack of cereal that much of a morning game changer? We were still starting our morning together. We were still eating breakfast. For once, I had an actual say in how I wanted to start my day. My voice mattered. And, I can’t imagine that I was the only kid in the world who felt this way. 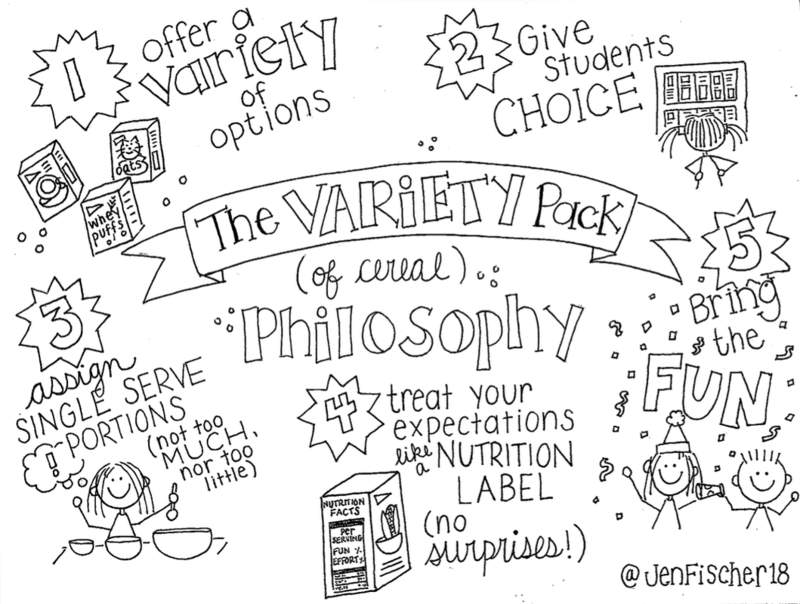 So, if we think about what the variety pack could do for breakfast--the variety, the choice, the fun--what could an actual variety pack philosophy bring to our classroom? Variety: The best part of the variety pack is the number of different cereals that make up the lineup. Offering a variety of ways for students to show their learning can help us to meet our students’ strengths and learning styles, while keeping them engaged and excited about what we are teaching. Think about it: when we give our students the same options, we get the same products. Variety can help to keep things fresh. Choice: What would be the fun in having a variety pack if someone told you what cereal you had to eat? When creating assignments, we need to give our students the freedom to make some of their own decisions. By giving students a choice in how they want to show their learning, we are giving them a voice and helping to create independent thinkers. Single Serving Size: In a variety pack, the cereal boxes are just the right size for a hassle-free breakfast. In the classroom, create assignments that are just the perfect portion for your students. Work shouldn’t require hours upon hours outside of the classroom to complete, nor should students be able to finish a task without much thought in a matter of minutes. Nutrition Facts: On a box of cereal, the nutrition facts are printed as plain as day. Kids and parents know what’s on the inside of the box and can make decisions based on the information printed on the label. Think about your expectations like a nutrition label. There should be no surprises when it comes to grading. ​Fun: While all variety packs include some nutritionally sound options, most kids would say that the too-sugary cereal choices are the best parts of the package. My mom never would have purchased an entire Costco-sized box of Froot Loops, but on occasion, she was OK with a frosted start to our day. Keep this in mind when planning new activities for your students. School should be fun. Don’t be afraid to bring in props, break out in song, or jump on a desk. Create experiences that students will remember. And create memories that (snap, crackle, and) pop. Every Monday, my week begins with a Weekly Thought Starter from Think with Google. Some of these ideas are motivational in nature, some challenge me to look at things in new ways, and some just get my mind racing about the great things that can happen in our schools if we just give our students a chance to think differently. This week's thought starter described what happened when, as part of a YouTube challenge, Google asked seven agency creatives and filmmakers to tell a video story in 6 seconds. 6. Seconds. The result? Seven thought-provoking, boundary-pushing videos that told a story in, you guessed it... 6 seconds. So, here's my own thought starter: How can we take the same idea, and challenge our students to tell their stories? What will happen if we give our students six seconds? Will they change a mind? Change a perspective? Change the world? Six seconds is all it takes. Six seconds to be heard. Share your students’ stories using the hashtag #6SecStory. Jennifer Fischer is a former middle school English teacher, full-time instructional coach, and part-time edtech nerd, who strives to help next JENeration educators transform learning for all students.